September, 2018 (Cheyenne, WY) – The Wyoming State Bar is pleased to announce that Laramie attorney Rebecca (Becky) A. Lewis is this year’s recipient of its Gerald R. Mason Professionalism Award. The award was presented at the Bar’s Annual Meeting & Judicial Conference, which took place last week in Laramie, Wyoming. Lewis is the eighth recipient of this annual award, presented by Rob C. Jarosh of Cheyenne, the Wyoming State Bar President. 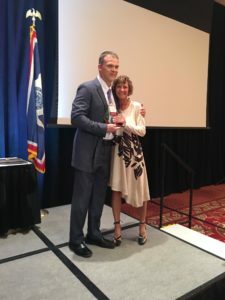 The Professionalism Award is given to the Wyoming lawyer who represents the highest standards of ethics and dedication to the law, but also recognizes someone who contributes their time and energy to making the Wyoming Bar and its lawyers the best people they can be. Lewis, an attorney at Pence and MacMillan in Laramie, practices civil litigation, employment law, and insurance law. Becky was born and raised in Powell before heading out of state for college and law school. After practicing for four years at a large firm in Los Angeles, she returned to Wyoming and started practicing in Laramie. Rebecca was Chief Bar Counsel for the Wyoming State Bar for nearly ten years, Special Assistant Attorney General for criminal appellate cases, and was a nominee for the Wyoming Supreme Court. She has taught numerous continuing education seminars for attorneys and both taught and guest-lectured in the areas of ethics, trial practice, and alternative dispute resolution at the University of Wyoming School of Law. She is also qualified as an expert witness in both state and federal court in the areas of ethics, insurance law, and litigation.